The truth is over 5,000 Black soldiers fought in the American Revolution. And though most were not recognized as citizens or even free man, more than 200,000 took up arms in the Civil War. Over 380,000 African-Americans served in WW I and more than 2,000,000 defended this country in World War II, Korea and Vietnam. Yet most accounts of their valiant actions are absent from history books and contemporary film. For Love Of Liberty: The Story Of America's Black Patriots finally, and for the first time, sets the record straight. 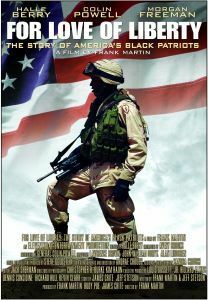 Ten years in the making, the 4 hour, 2 part PBS documentary is introduced by Colin Powell, hosted on-camera by Halle Berry and features an amazing cast that reads from a collection of letters, diaries, speeches and military records that document and acknowledge the sacrifices and accomplishments of African-American service men and women since the earliest days of the republic. The story spans the Revolution to Afghanistan and examines why, despite enormous injustice, these heroic men and women fought so valiantly for freedoms they themselves did not enjoy.